I was watching Sony’s E3 2015 Conference and in between the announcement for the remake of Final Fantasy VI and Shenmue III, Devolver’s PS4 Indie reel was shown. All of the games presented looked amazing, but there was a particular one—and this is not an understatement—that made me stand up off my chair. It was Mother Russia Bleeds. I was transported to a 2D brawler that felt like Hotline Miami for almost a minute and automatically felt in love with it. Today I had the opportunity to ask Le Cartel, the developers of the game, some questions that shed some light on future mechanics and backstory for the upcoming title. First of all, Who is The Cartel and how was it formed? The whole story began in september 2013. Alexandre “Opreem” Muttoni was Art Director in a Digital Agency. He never worked in video game industry, but of course was totally passionate by this medium, and had a long gamer experience. He just left his last agency when he met Frederic “Fred” Coispeau at a BBQ. Fred has a licence in game design, and worked at Ubisoft on “Just Dance”. He just quit his last job too, and wanted to make a team to create an indie video game. This meeting was totally incredible: Two guys in Paris with a lot of free time, some benefits from the state, with the same ideas, some complementary skills, and actually neighbors! That was a sign from the universe. So they started to work on a Beat’em’all... When they had a plot, and the first sketches, they put it on a Facebook group, and that was a success! A lot of people were totally into it. So they hired Florian “Flo” Reneau, a young recently graduated programmer, which just finished his last intership, and a crazy fan of Beat’em’up. And few months later, Fred contacted a friend of a friend: Vincent “Sloman / Slo” Cassar from “FIXIONS”, an awesome music composer who lives in the south of France, who’s now in charge of the OST. This is story of “Le Cartel”. Are you aiming to have a difficulty similar to what Streets of Rage was back in the day? “Mother Russia Bleeds” is quite different than “Streets of Rage”. We don’t want to create a too slow beat’em up like in the 90’s. So we decided to make a game really faster, and more difficult. It’s almost a “Die and Retry”. You need some skills to survive. There’s a lot of enemies, you’re often surrounded, you need to use some drug to be faster and stronger... Actually the experience is between “Street of Rage” and “Hotline Miami”. We don’t think that a game containing the same mechanics from Street of Rage because we don’t feel it could be really appreciated if it’s been released nowadays. Gamers don’t have the same expectations and the same needs than in the 90’s. Of course “Mother Russia Bleeds” is a an old school beat’em up, made by beat’em up big fans, but built with a new vision. We think it’s its strength. Will you be able to unlock new skills or is the move set limited to what we saw in the E3 2015 demo? Haha you want some fresh news huh?! Actually yes, we’re working on total new moves. We wanted to be sure the core gameplay was enjoyed by the players before starting the details. After the E3, we know for sure we’ve got a cool gameplay, so now it can evolve. We’re not sure to add an unlockable systems for moves. We know that it’s the trend: hooking the players with an unlock new moves/weapons system... But we’re not really into that. Maybe we’ll only add some unlockable syringes with new effects... Stay tuned, it’s gonna be awesome. Could you explain a bit more about the syringe and how it will affect gameplay? You can use it in two ways: To heal yourself, your partners, or to go into berserk mode. In berserk, you’re faster, stronger, and you can use a huge and gore fatality attack. You can fill your syringe up on some of your enemies once they’re dying... The syringe system is still in progress, we have a lot of ideas about it. Anything you can share on the story of the game? In an alternate U.S.S.R. to the late 20th century , the Mafia controls the country and imposes their own rules. While the population sinks into a deep misery , the Godfathers get richer, controling networks of drugs, arms trafficking and political corruption. Sergeï , Ivan, Natasha and Boris live in a small community in marge of society, which survives with the illegal fights. They’ll be kidnapped and used as guinea pigs for some drug experiments. The game has been in development for a while. How has the support from the community helped you continue building the game you have dreamed of? None of us could imagine that the project would take so much time. The most difficult moment was probably when Fred and I were looking for a programer... We asked to a lot of people, and nobody really believed in that project. We almost lost our hope! But after we put the pre-alpha trailer on Youtube, everything was different. So many tweets, so many emails, so many Facebook or VK (the Russian Facebook) comments... It’s awesome. They give us the motivation to work our a** off to make the best game we can. And before we signed with Devolver Digital, so many people asked us “Where is the Kickstarter? !”, or “Shut up and take my money”. It’s so great to have a community like that, you’re not afraid anymore by the money, or by the success of your game. You can be 100% focused on the development. Thanks to them, again. Will There be online co-op? It’s in progress. The last version of Unity gave us the tools to work on that, so it’s really new for us. If it’s too complicated, and need too much time to be effective, may be we’ll release the game only in local in a first time, and we’ll work the online after that. It’s too soon to make any promises about that. Can you explain to us a bit about what the process is like when building a good co-op game? Our first objective was to give a really great feeling about the punches. A Beat’em up is all about punching. So if this basic feeling isn’t perfect, all the game will be boring. We saw that problem in a lot of Beat’em up. So we worked sooooo much time on that. We really think it’s the key to make a good brawler game. Without being too technical, our way to work is always: The basics need to be perfect before working on the details. And about the coop: We thought that the most important thing is the interactions between players. In MRB, there’s no power up items. The players are all by themselves or their mates to survive. And we worked on combos too. For example: a player can throw on you an NPC, so you can hit him with in the air to make a homerun. It’s really fun. After that, we worked on the complete gameplay, the inputs, the graphics, the FX... And only after we thought the solo mode was great, we added a new character. There is a lot of gore in the game. Was this the concept from the start for Mother Russia Bleeds? It’s a real topic: The violence in video games. A lot of people thinking that it’s a problem, and others think that it’s fun... We don’t have the answer. The thing is: We wanted to create something that we’d love to play. And, may be it’s a problem here, but we like violent games (and violent movies BTW). The game which gave us the motivation to make our own game is Hotline Miami so... We really think that if you don’t like to play to your own game, the players will feel it. 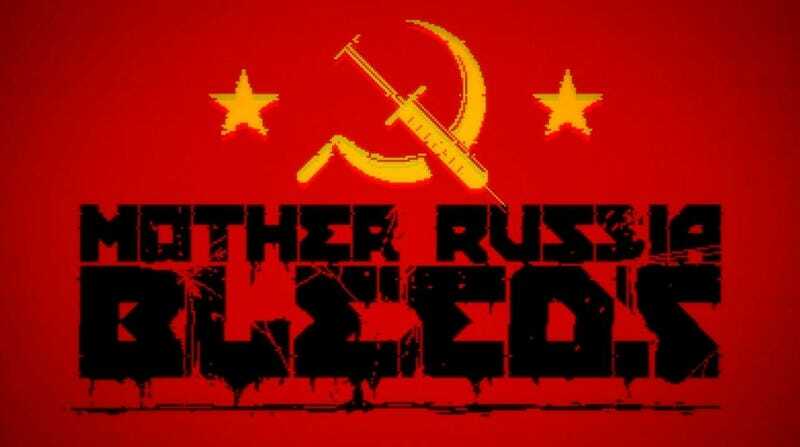 And we LOVE to play “Mother Russia Bleeds”! And a huge majority of the play testers are laughing when they’re playing it. What better feedback could we have? What are your biggest inspirations for making this game? “Streets of Rage” and “Hotline Miami” we guess, surprising? The universe, the gameplay, the music, that game is a crazy experience. But we have so many more inspirations... Each level has it’s own universe, so we have some different inspirations for every levels. Scarface, Only God Forgives, The Godfather, Gaspard Noe’s movies... We can’t name them all. That’s what we’re trying to do here: Bring the players in different universes!